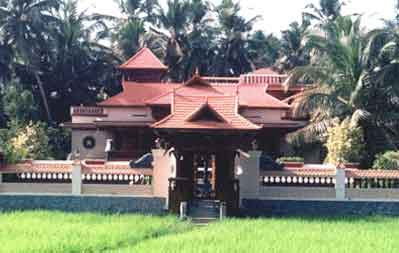 Located in idyllic and serene surroundings so typical of verdant Kerala, Dharmikam is a center of learning for Kalaripayattu and a center of healing through Kalarichikilsa by therapy and treatment for rejuvenation and healing of disabilities, diseases and injuries. The spiritual center of the ashram is a magnificent temple dedicated to the Lord Hanuman. Teaching in Kalaripayattu and Kalarichikilsa is imparted through the traditional guru-sishya parampara where the disciple takes up residence with the master. Graded certification of progress and proficiency is awarded at the Basic, Intermediate, Advanced and Instructor levels. Accommodation in the form of comfortable rooms and cottages with all modern conveniences are available and nutritional vegetarian meals are served to the residents from organically grown food. KalaripayattuTraining Is a graded training schedule demanding dedication,desciplineand devotion. It is stratified into different levels. The treatment comprises reading of pulse, diagnosing blocks in the flow of energy and balancing it. The treatment includes restoration of the smooth flow of energy and indemnifies the disproportion of Tridoshas in the human body. The therapy involves detoxification -a method of removing impurities, which accumulate in the body as a result of metabolic imbalance. The treatment involves PACIFICATION OF “JADARAGNI” and restoration of vital energy . Meditation which helps to achieve perfect body -mind synchronisation is an essential component.